71 for a canker in the mouth Take plantine bittony egrimony violets and woodbind and boyle them in wine or water with isope pimpernell and green walnuts and therewith wash foure times in a day and hold it in your mouth. For ache in ye hinder part of ye head flame sage with the whithe of an egge and temper it with vineger and lay it thereto. 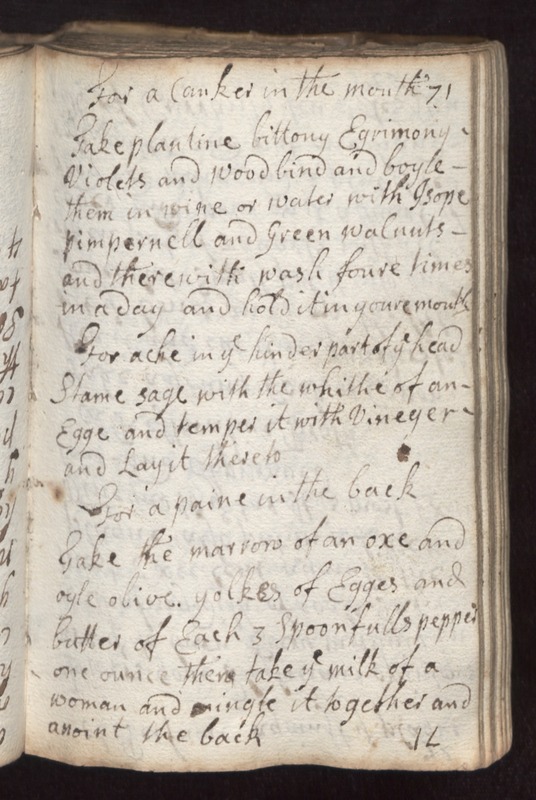 For a paine in the back take the marrow of an oxe and oyle olive yolkes of egges and butter of each 3 spoonfulls pepper one ounce then take ye milk of a woman and mingle it together and anoint the back.